Day 2! I just finished watching MAMA 2016 and I am so proud of my boys winning Best Dance Male Performance Group & Artist of The Year! 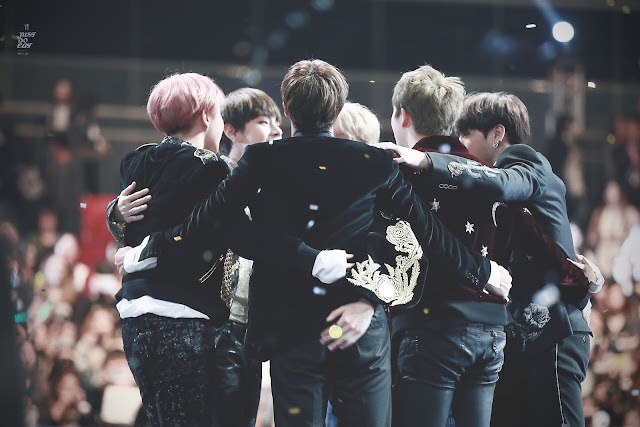 축하해요 Bangtan Sonyeondan ☺ Who would have thought BTS became the first artist not from 'Big 3' entertainment company to win Daesang Award? This is their second time btw, their first Daesang is on MMA 2016 (Album of The Year). You guys nailed it!! From what I've known, they have been motivating themselves as a group with the quote above since years ago or perhaps since pre-debut. They did mentioned this quote in Twitter 2 years ago if I am not mistaken and many fans start to flashback all their achievements after all this time. Their hard work as a team paid off. As an idol coming from a small agency, it can be considered as real quick hah? That's teamwork. We can never deny the power of teamwork, everyone. I do believe that teamwork is essential to bring success in someone's life. You cannot stand in this huge world alone. It is true that sometimes you have to learn to stand alone in your own both feet but how can you expect yourself to settle everything down on your own without the help of others? Even you want to go on a vacation or somewhere else, you need people around you to find certain place. Technology is limited guys. In this globalization era, you cannot depend too much on technology. It could make it worse. Does asking or talking to people at your surrounding even cause you a disease? Are you an anthropophobia or what? I seriously do not understand people who easily put a mindset not to ask others for help and prefer doing something on their own. How can you be so timid while others are so willingly to lend a help? I noticed that these people thought themselves as a burdened to others and they also thought that others might want to take advantage for what they've done. These thoughts are so... hm what do you guys think? I'm not joking. There's a personal reason I choose this quote. One of my friend is so into herself that I cannot explain how detailed she keeps on mentioning in social websites about how terrible her life is being surrounded by her friends. She wrote about it endlessly. Few people might show their sympathy towards her but for me, she is selfish. Proud of herself doing group assignment as an individual assignment and then send it to lecturer and ask lecturer for separate marks like seriously babe? What are you thinking about? She is not even my group mates but I pity her members who need to struggle physically and mentally by having such a group mate. Nowadays, even teamwork got marks. If you feel so stress and you think all the burden on completing task is on you why don't you try to slow talk with other group mates so that they can be aware of your current hard situation. Don't keep it to yourselves. See! What happened? The worst part is you can still type 'hahahaha' and even put a smiley at the end of your words in Whatsapp group but you ended up curse them a lot in social websites. I acknowledge everything. We all, classmates clearly understand what's going on but we do not want to make things worse. I did mentioned this quote in Twitter with purpose to make her feel somewhat wronged for being like that but I guess that was too weak (I know she noticed my tweet). Many professionals, educated people, and even school children out there know that teamwork ease our task. Less difficulties but great achievement. Right? I've been so active working in teamwork since school and I think that is one of the best way to gain success. We can also become better persons who can adapt with such working environment as time goes by. Let's just not be selfish guys. Everyone needs everyone else in every single situation. People relying on each others and this is the world we live in. "Janganlah kamu saling memutuskan silaturrahim, janganlah kamu saling belakang membelakangi, janganlah kamu saling benci-membenci dan janganlah kamu saling hasad menghasad. Sebaliknya jadilah kamu hamba hamba Allah yang bersaudara. Tidak halal bagi seorang Muslim itu memulaukan saudaranya (yang mukmin) melebihi 3 hari"
Hi Ziera (if that what's written), thanks for stopping by on my blog. I really appreciate your compliments. So, you are new in blogger or just renew to be a blogger? Here is my suggestion. Insert a chatbox in your blog so that your readers will find it easy to communicate with you ;) Have a great day! good luck for your 31 days blogging challenge !